Big relief today: almost a month after the European Elections took place, one of our secret BBC project finally goes public. I italicize the word, because it's not really public, as a matter of fact. You can read all about this project on the brilliant Source blog, run by OpenNews, a product of a partnership between Mozilla and the Knight Foundation. It's a first try at answering the question "can linked data and computer-assisted journalism make the news?" 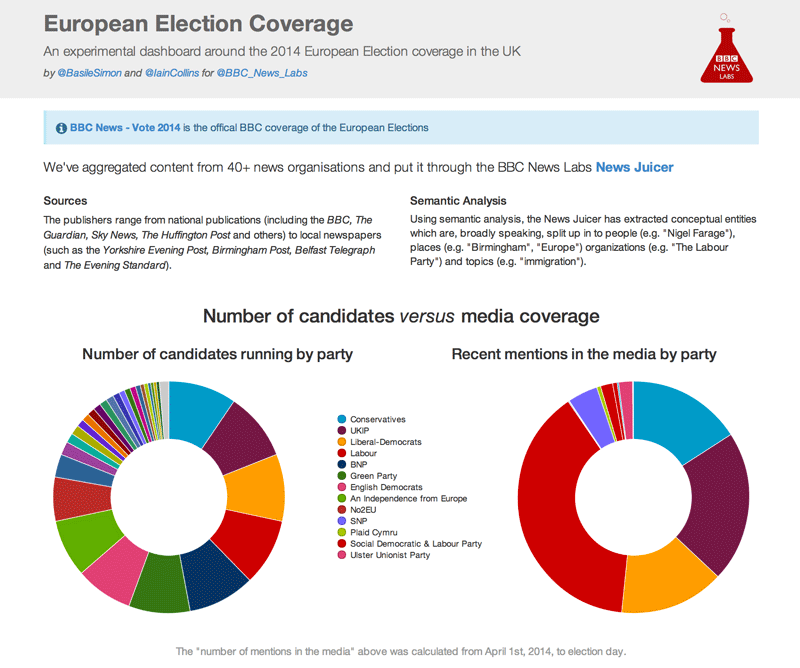 Basically, Iain and I used BBC linked data tools to gather some data around the EU elections in the UK, and presented them on a website. There were editorial decisions: we had to decide what to show. We decided to display the repartition of mentions in the media and a historic graph of the media coverage for each party, as well as associated concepts for each party and candidates, but also relevant news articles for each candidate and around the elections. But the originality is that we did not write the news. We did not discriminate nor select what's on the screen (except for formulating the queries, of course). The web-page is computer-generated. In fact, that's not even news. That's background, context, and... meta-journalism. Now, go read the article. News nerds are coming.